Metro-mayors: campaigning in poetry, governing in prose? Hugh Carey, former Governor of New York State, claimed that politicians campaign in poetry and govern in prose. Whether it is Andy Burnham’s claim to make Manchester ‘a beacon of social justice to the rest of the country’ or Steve Rotheram’s ambition to build a Liverpool City Region that is ‘ambitious, fair, green, connected and together’, one could be forgiven for assuming that the new metro-mayors will have a unique capacity to transform the lives of local people. The reality is less poetic. The Government had aspired to secure elected mayors in each of the six major cities within its fabled Northern Powerhouse: Greater Manchester and the city-regions of Leeds and West Yorkshire, Sheffield, Liverpool, the Tees Valley and the North-east. Ultimately, only Greater Manchester, Liverpool City Region and the Tees Valley were able to go ahead with elections in May 2017 (although elsewhere in England mayoral elections will also be held in the West Midlands, the West of England and Cambridge and Peterborough). The appearance of an ostensibly non-political figure, Andy Street, the former head of John Lewis, as the Conservative candidate in the West Midlands has not been replicated in the three northern areas where the frontrunners in each campaign are candidates from the main political parties who are already elected and established politicians. Moreover, in each of these three Northern areas, Labour is predicted to win the election. This blog, the first of three that will assess the new metro-mayors, will focus on the three Northern areas. Among the formal powers which the devolution deals have established are such issues as housing, skills and transport although Greater Manchester, in the devolution vanguard, has additional powers in the areas of health and social care and criminal justice. Yet most of these powers are formally attributed to the combined authorities rather than to the metro-mayors directly. The genesis of metro-mayors matters. The negotiated nature of the office, arising from the devolution deals negotiated by each city-region with Government, explains the variations in the powers attributed to each combined authority and the way in which these powers are shared between the combined authority and the metro-mayor. The metro-mayor is in a double bind: constrained by the limits of the devolution deal agreed with Government and constrained by the need to reach agreement with the combined authority. The only policy which will come under the direct control of the metro-mayor, in each of the three city-regions, is a devolved transport budget. In the Liverpool City Region and Greater Manchester, the metro-mayor also has powers over strategic planning, franchised bus services and smart ticketing. All other powers are either particular only to the metro-mayor of Greater Manchester such as the ‘earn-back’ scheme and the role of the police and crime commissioner or are powers attributed to the combined authorities. Relationship building will be a key task for the new mayors. 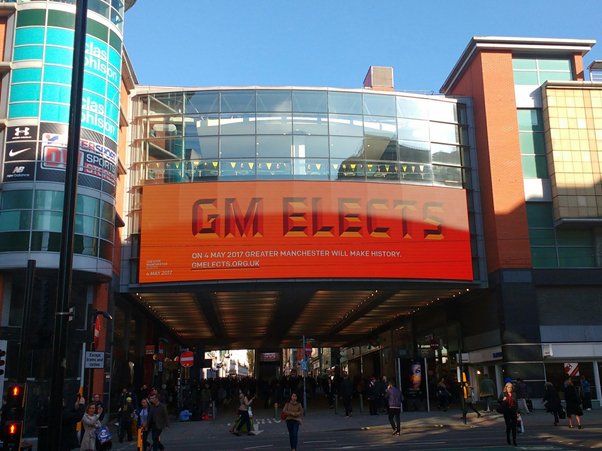 Despite the variation built into the position of metro-mayor, common themes have emerged in the campaigns in Greater Manchester, Liverpool City Region and Tees Valley. These include a focus on fostering economic growth to deliver better paid and more highly-skilled jobs, improved housing and better transport connections which is often linked to the need to combat air pollution. Yet given the challenges in these three areas, for example, deindustrialisation, higher than average unemployment, low productivity and a low skilled population and poor health outcomes, it is unsurprising that the candidates are advancing ambitious plans. The course of the campaigns suggests a much less constrained political position than the formal powers dictate as each candidate has appealed to the vague catch-all category of soft powers. There is widespread recognition amongst business and other interest groups that the new mayors will be figureheads for their areas, engage in negotiations with both potential investors and central government, have accountability for new developments in their city-regions and act, to use the concept advanced by the longstanding advocate of metro-mayors Lord Heseltine, as convenors. That each candidate does not feel constrained by the formal powers on offer is clear in the way in which each has aspired to offer a holistic and transformative vision for the area. The extent of this aspiration is perhaps best summed up by the claim that Greater Manchester ‘will make history’ on May 4th. Below the rhetorical surface, however, the details in each manifesto do suggest some distinction exists between the candidates. This distinction is between candidates who are part of the existing regional institutional structures, for example, the Conservative candidate in Greater Manchester, Sean Anstee, who is already on the Greater Manchester Combined Authority as leader of Trafford Council and the Labour candidate Sue Jeffrey in the Tees Valley who is similarly already a member of the Combined Authority, and those who have come from national politics such as Labour candidates Andy Burnham and Steve Rotheram in Greater Manchester and Liverpool respectively. The latter tend towards a much bolder vision for the area while the former are more committed to carrying out the plans already established consensually by the combined authorities. Even those with experience of working within the existing structures, however, are necessarily drawn by the imperatives of participating in hustings or the need to produce ’60-second’, media-friendly manifestos and so run the risk of overpromising what can be achieved through the office of metro-mayor. One area where all candidates are in danger of overreach is education. Each of the three city-regions exhibits educational problems which contribute to unemployment rates well above the national average. Yet, the powers attributed to the metro-mayor in this policy area are limited to skills and Further Education. This does not deter them from advancing policy preferences outside of these policy areas. In Tees Valley Labour’s Sue Jeffrey has expressed the importance of the recruitment of outstanding head teachers to achieve effective skills outcomes and in Liverpool Steve Rotheram asserts his desire to tackle underachievement in schools in core subjects like Maths and English. In Manchester Andy Burnham says if elected he will convene meetings of head teachers to ensure that all children are school ready, ensure that the schools’ curriculum encourages vocational provision and establish a UCAS-style points system so that school children can aspire to advanced technical education on a par with University entry. Similarly, Sean Anstee, has pledged to work with schools to ensure that pupils leave education ‘digital-ready’. Education illustrates the problem that the metro-mayor candidates aspire to act in policy areas beyond their remit which points to a possible risk in their first short three-year term of office. Many of the candidates’ manifestos have highlighted the need to renegotiate their devolution deal both with Government and the combined authorities in order to extend the formal powers of the office and thus be able to deliver on their ambitious promises. Yet a focus on renegotiating the powers of the office could well be at the expense of delivering quick wins to an electorate. Such wins will arguably be necessary in order to establish with local people the benefits of a directly elected metro-mayor. A week today the campaigning will stop (at least for the metro-mayors) and the task of governing and defining the new office begins. In Part Two of this spotlight on the new mayors we will look at what kind of election the metro-mayor contests have been, campaigning methods and the relationship between these elections and national parties.